Ever have a day that just got off wrong from the get-go? You know, the one where you wish you could go back to bed, start the day over, and get a do over? Well, my day was like that. I woke up 18 minutes late and had to rush to get ready. I got to work later than I wanted, and that just seemed to throw my whole day off. Luckily, I'm home now and it's all over with. 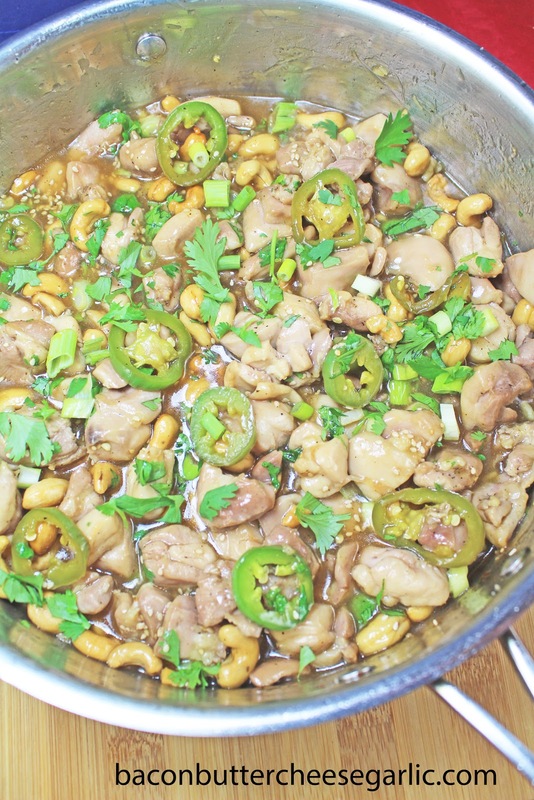 Fortunately, this Cashew Jalepeno Chicken dinner isn't one that needs a do over. In fact, it's pretty spectacular. It was really fast and easy to make, and there were zero leftovers, which is great because sometimes I have way too many leftovers and have to pawn them off on my coworkers. I used boneless skinless chicken thighs for this since the meat is juicier. But you can use chicken breasts if you like. I also used one large fresh jalapeno for this dish, which gave it exactly the right amount of heat. You can add more if you like it hot or leave it out altogether. All in all, this dish can make up for the worst of days. Enjoy! Drizzle some peanut oil into a skillet. Season the chicken with salt and pepper and cook the chicken on medium high heat until it's done through, about 6-7 minutes. Meanwhile, whisk together the cornstarch and the water. Whisk in the soy sauce, rice wine vinegar, sesame oil, garlic, honey, and the juice of the lime. Pour the sauce into the skillet with the chicken. 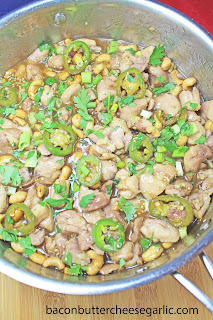 Add in the jalapeno slices and the cashews. Bring it to a slight bubble. Reduce the heat slightly and cook until thickened, about 5 minutes. Remove it from the heat and stir in the cilantro, sesame seeds, and the green onion. Serve it over rice, if desired. 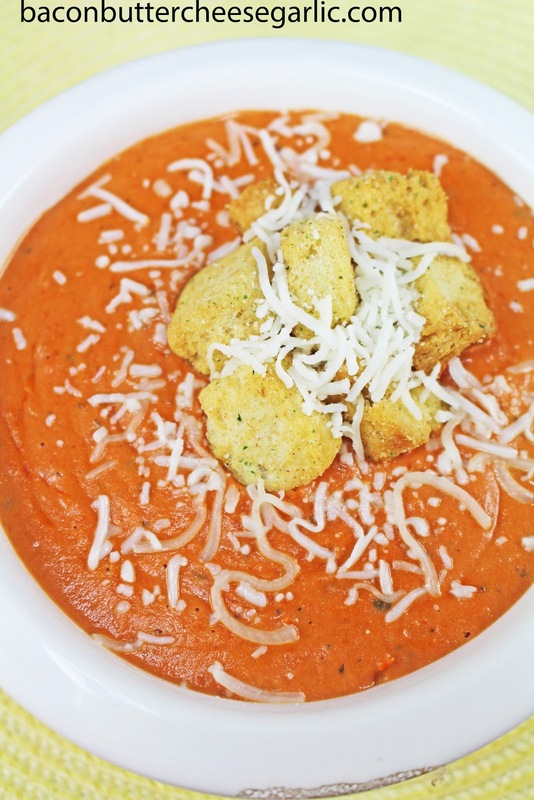 Want a Quick Tomato Bisque without the all day work? This recipe delivers that slow cooked taste with minimal effort. I would highly suggest using Cento brand crushed tomatoes. The ingredients only say "crushed tomatoes" and no added stuff. And I wish they were paying me to tell you that, but they aren't. I just believe in their product. 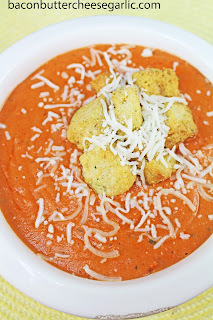 Throw this soup on and serve it with a grilled cheese sandwich for a hearty easy meal! Melt the butter in a large pot. Cook the onion and garlic until tender, about 5 minutes. Whisk in the flour. Next whisk in the chicken stock. Add in the tomatoes, heavy cream, mustard powder, salt & pepper, and tomato paste and whisk until smooth. Bring it to a slight bubble and cook until it's thickened. Stir in the fresh basil and serve with the croutons on top. Here is a twist on traditional potato salad. 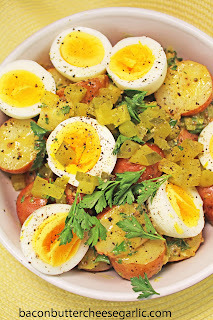 This is Warm Potato Salad with Mustard Vinaigrette. It can be eaten cold too. It's a little savory, a little sweet, a little sour, and a lot good! Enjoy! Put the potatoes in a pot and cover them with water. Boil the potatoes until they are fork tender, about 15-20 minutes. Meanwhile, boil the eggs to your desired doneness. I did about a 7-minute egg because I wanted semi-soft centers. Whisk together the vinegar, garlic, mustard, honey, olive oil, and salt and pepper. Put the mustard seeds into a small skillet. Heat the skillet over medium low. Cook the seeds, shaking the skillet back and forth constantly, until the seeds start to pop, about 1-2 minutes. Whisk the seeds into the dressing. Peel the eggs and halve them or quarter them. Toss the potatoes, green onions, and the parsley with the vinaigrette. Gently stir in the eggs and serve. It's that time again. Back to school. The dreaded time when everyone has to hurry every morning to get up and get ready and when time is short in the evenings. We've spent the day running errands for school, last minute clothing purchases, haircuts, car washing, paying lunch money, etc. Everyone has to set their alarms and go to bed early. I know a lot of moms look forward to back to school, but not me. It means driving an extra 15 minutes twice a day and less time in the evening to get things done. It means worrying about grades and filling out extra papers and paying extra fees. It's a hassle, for sure. It's this time of year that I struggle to find quick meals. Sure, I try to find quick meals all the time, but especially during the school year. I love shrimp, and I love the combination of spinach and tomatoes. 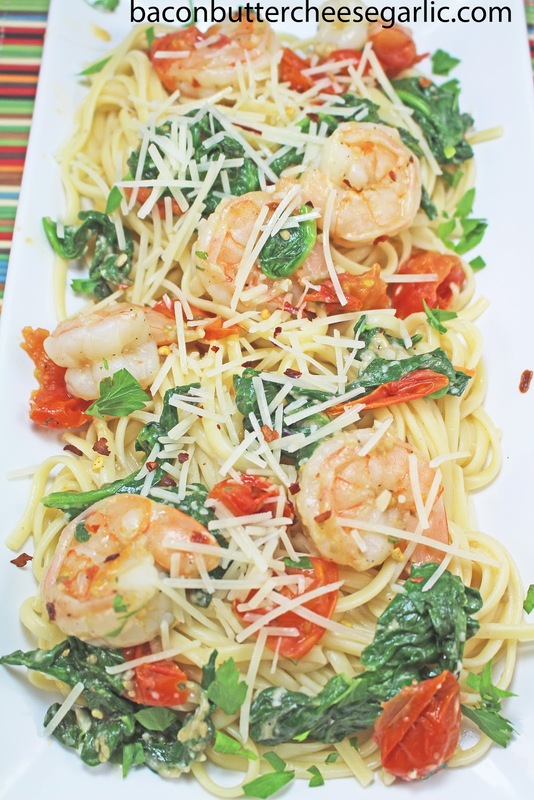 This Shrimp Florentine Linguine has both. It's a brothy pasta, which is great for sopping up with a piece of French bread. This dish is pretty easy and quick to put together. It's filling, but you're not so stuffed you have to loosen your pants. The boys were pleased with this dinner, and I think you will be too. Enjoy! Melt the butter in a large skillet and drizzle in a little olive oil. Cook the garlic for about a minute over medium high heat, stirring constantly. Add in the wine to deglaze the pan. Add in the tomatoes and cook until the tomatoes start to soften, about 3-5 minutes. Add in the chicken stock and the shrimp and cook the shrimp until it's done, about 5-7 minutes. Add in the spinach, salt & pepper to taste, and the chili flakes to taste. Turn the heat down slightly. Cook and stir until the spinach is wilted. Remove the skillet from the heat and squeeze the lemon juice over the top. Stir in the Parmesan cheese and the parsley. Mix the shrimp mixture with the drained linguine and serve. You know how moms will sacrifice anything for their children? Sure, we would jump in front of a bullet or a moving train for them. But sometimes it's the little things. Like sneaking a little cash to them for a snack or giving them an extra piece of candy. Or not getting to go on date night because they're sick. Well, I got a flat screen TV for our bedroom for Christmas. We really haven't watched it a whole lot. I tend to not want to get rid of things we will use "in the future." But we just bought our son a pickup truck, and it's older and didn't have a great stereo in it. My husband texted me and asked if he could sell it to replace the stereo. I immediately answered "YES!" You see, the real sacrifice I'm making here is time for the two of them to go outside, tinker on a project, and spend time together. What better thing is there than a father and son bonding. I have had to drag them in the house, though, come dinnertime. This particular pasta dish has a rather long name and more than a few ingredients, but I'll give you some shortcuts. 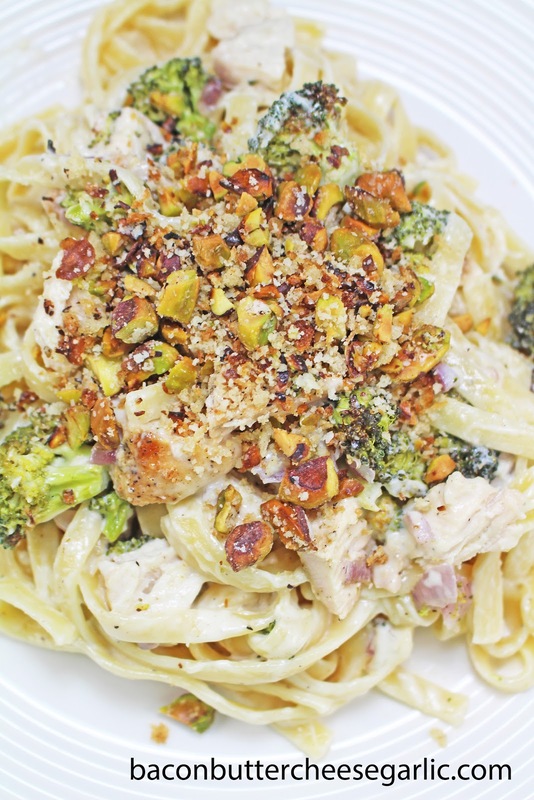 This is Roasted Broccoli & Chicken Alfredo with a Pistachio Crumble. Sounds complicated, but it tastes fantastic! Now, I included roasted red onions in this recipe. My son picked them out. My daughter wasn't here to eat it. My husband loved them, but I felt they were too strong for the dish. But the star here is the roasted broccoli and the pistachio crumble. If you're a fan of either, you're going to love this. Enjoy! NOTES: You can substitute a rotisserie chicken for cooking your own. Just pull the meat off and shred it and set it aside. You can also substitute store-bought Alfredo sauce. You will need about 2 C of sauce. Like I said above, the onion was a bit much bite for this creamy sauce, so you can leave it out if you like. Preheat the oven to 425 degrees. Cook the pasta according to directions. Sprinkle the chicken breasts on both sides with some seasoned salt, garlic powder, and black pepper. Put the chicken on a sheet pan. Cook it for 20 minutes and flip it over. Continue cooking 15-30 minutes longer OR until a thermometer inserted in the center registers at 165. Let the chicken rest covered for about 8 minutes. Meanwhile, spread the broccoli, garlic, and onions out on a sheet pan. Drizzle the veggies with olive oil and season them with salt and pepper. Mix them around with your hands and spread in a single layer. Cook the veggies for about 20-25 minutes or until the broccoli starts to brown and all the veggies are soft. For the sauce, melt the butter in a saucepan. Add in the heavy cream, garlic powder, and pepper. Bring it to a slight boil. Turn the heat off or reduce it to low. Whisk in the Parmesan cheese in small handfuls and keep whisking until smooth. For the crumble, melt the butter in a small skillet. 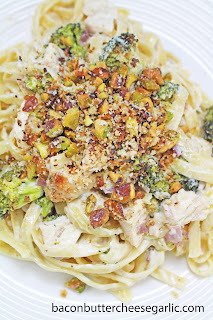 Add in the breadcrumbs and pistachios. Cook, stirring constantly, for about 5 minutes. Remove it from the heat and place it in a bowl. Stir in the Parmesan cheese. Drain the pasta and chop the chicken. Stir the veggies, sauce, and chicken into the fettuccine. Serve the pasta with spoonfuls of the crumble over the top. So my husband surprised me last week with a road trip. We went to San Antonio and had dinner and stayed in a hotel on the Riverwalk. The next day we got up and drove to Wimberley, Texas, where he had rented a house with a pool on a river. It was fantastic! We went to an olive tree farm where we sampled fresh olive oil, which is really kind of strange to drink by itself. We visited a place called Jacob's Well which is a deep little natural pool that you can jump into. We ate at a famous BBQ restaurant. We went into Austin and did some antiquing. And we went through Fredericksburg, Texas, which is little German town with fantastic shopping. It was a great trip, and we had a wonderful time. Our kids love Shrimp Boils, so we thought we'd treat them to one when we got home. But this time we did it in foil packets on the grill. It took less time to cook and we didn't heat up the house. And it was darn tasty! We filled the packets with jumbo shrimp, andouille sausage, scallops, potatoes, corn, and even a little bit of lobster meat. I hope you enjoy it as much as we did. NOTES: For the melted butter to serve it with, I put a little garlic powder, dried parsley, lemon juice, and salt and pepper in the butter. We also tear off hunks of the bread to dip into the butter too. I partially cooked the corn and potatoes in the microwave to make sure they would be soft after grilling. Prep the potatoes first. Then put them into a microwave safe bowl. Cook for 15 minutes, stirring at 5 minutes and 10 minutes. Then cook the corn for five minutes in the microwave in a bowl with some water in it and covered. While the veggies are cooking, prep the rest of the ingredients. Slice one lemon in half and then each half into 8 slices. Cut the other lemon into wedges for serving. Have four large sheets of foil ready and preheat the grill to high. Divide the potatoes, corn, shrimp, scallops, lobster, sausage, onions, and garlic onto each piece of foil. Season them with salt and pepper. Sprinkle 2 teaspoons of Old Bay seasoning over each packet. Mix them around with your hands. Drizzle some olive oil over each packet and place 1 T butter on top of each packet. Sprinkle some parsley over each packet and place 4 lemon slices into each packet. Wrap the packets up. 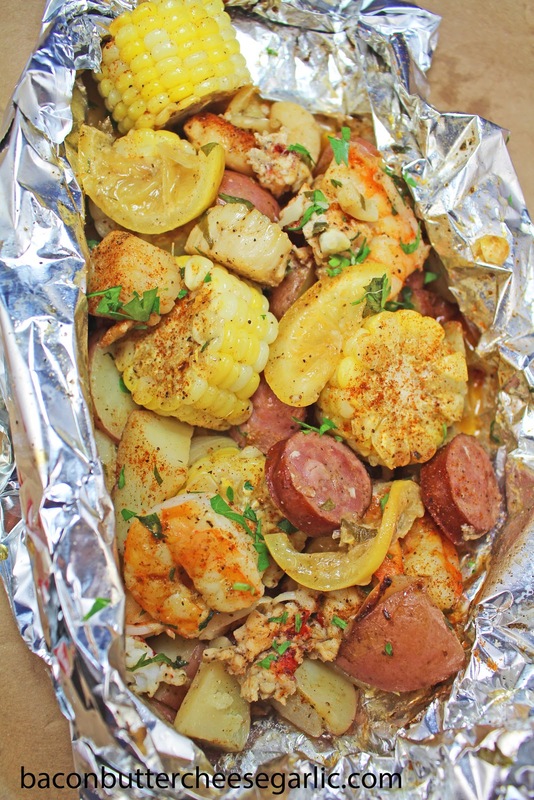 Grill the packets over direct heat for about 15-17 minutes or until all the seafood is done. Serve the packets with the melted butter and lemon wedges and hunks of bread. 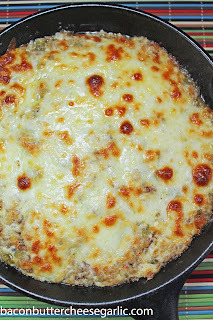 I made this Philly Cheesesteak Dip last night, and the four of us just stood around the kitchen counter and gobbled it up. Even my picky son who thinks he doesn't like onions and peppers loved this. I cut a loaf of French bread into strips and slightly toasted them for serving. Enjoy! Preheat the oven to 350 degrees. Melt the butter in a skillet and drizzle in some olive oil. Cook the onion, bell pepper, and garlic until soft, about 5-7 minutes. Season the veggies with salt and pepper. Use a potato masher or whisk and mash together the cream cheese, mayo, and half of the Provolone. Stir in the roast beef, veggies, and season with salt and pepper. 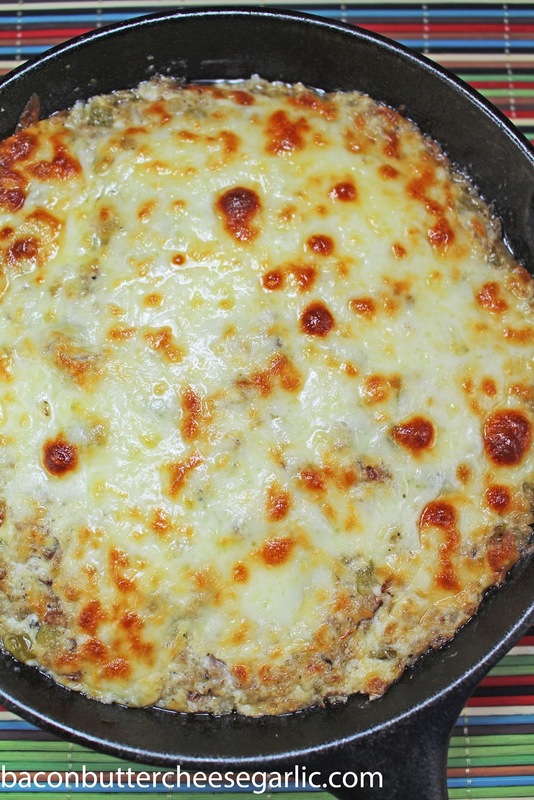 Spread the dip into a small baking dish. Sprinkle the remaining Provolone over the top. Bake the dip for 20-25 minutes. If desired, broil the top for about 5 minutes to brown the cheese. Serve with strips of toasted French bread or crackers.